Orthopaedic Complications: how to prepare ourselves for one! Head of Dept. of Orthopaedics, Holy Spirit Hospital, Mahakali Road, Andheri (E), Mumbai – 400093 India. The concept of analysis of desired and expected benefits versus potential risks and costs is attributed to 18th century mathematician Daniel Bernoulli, and bears relevance even today to our practice of Orthopaedics, specifically with respect to complications. Our huge population in India and the volume of our work helps us to examine and review a large number of patients with a spectrum of lesions. In such a wide scope of our work, one treatment does not suit all problems associated with the personality of that injury/disease. It is extremely important to be well informed and knowledgeable. Also we need to be thoroughly equipped with not only one plan, but to have ready contingency plans for any eventuality or complication. Such an approach can help us avoid problems and complications as well. Attending conferences, clinical meetings and reading journals among other things, gives us the exposure to clinically time tested techniques from experts in the field. Their evidence based data and analysis of their volume of work, can be beneficial, when we are faced with a dilemma of what is best for our patient. An athlete with a shoulder dislocation has to be assessed thoroughly, keeping in mind that the surgical technique used will have to support his speedy recovery to pre injury status. Non athletic person may need the same technique but his expectation of recovery may be different and less pressured. Hence the management and rehabilitation will have to be tailored to meet the needs of the patient. Where as an athlete or an insured patient may demand a top of the line modality/implant, one with lesser financial means may even want to avoid surgery and seek more conservative management. These can simplify the management and reduce serious complications. We, as modern day clinicians are fortunate to have as a resource, modern day imaging to confirm our diagnosis. Personally, I feel content when my clinical diagnosis matches that of the radiologist. It helps remarkably to see oneself and discuss finer aspects with the radiologist. The opinion of a competent radiologist, who is well informed about the patient, can be an asset to the Orthopaedic surgeon in confirming the minute details of the pathology of the problem. Taking help of our peers while dealing with a complex case scenario is a wise thing to do . So in our effort to get a proper diagnosis, we need to get a valuable history from the patient. The history must be well integrated with a detailed clinical examination and imaging. This will help us to make a proper decision and arrive at a tailor made treatment for that particular case. We must take into consideration many factors, like the personality of the injury, occupation of the patient and economic considerations, which will help with a comprehensive treatment plan. Most often complications can be controlled, when the procedure is done in a technically sound way by executing that particular plan for that specific patient. The theme of this issue is Complications. Complications not only result in untold misery for the patient but also add to the anxiety and stress of the surgeon. It is something we all want to avoid and keep at bay. We hope the above editorial gives some insight for the same and we request our readers to write to us their opinions and suggestions as letter to editors. We are also glad to share that our journal is now indexed with Index Copernicus and thus now fulfils all the requirements for an indexed journal as laid by MCI. This has been achieved in a short period of one year and we would like to thanks all our authors, readers, reviewers and editorial board members for supporting the venture. We would like to extend personal gratitude to the entire Bombay orthopaedic society and all its members and look forward to their support and submissions in years to come. We leave you now to enjoy the issue and also enjoy WIROC 2017. 1. Shyam A. Wisdom of the Crowds: Extending the Domain of Medical Information to Case Banks and Online Forums. J Orthop Case Rep. 2013 Apr-Jun;3(2):1-3. 2. Gulia A. Let’s treat a Doctor as Human!!! Indian J Med Sci 2017 April – June;69 (2):1. How to Cite this article: Antao N, Shyam AK. Orthopaedic Complications: how to prepare ourselves for one! . 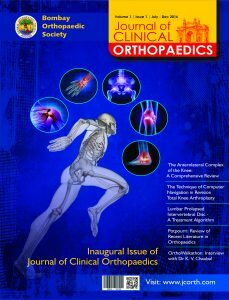 Journal of Clinical Orthopaedics July -Dec 2017; 2(2):1-2.
http://jcorth.com/wp-content/uploads/2016/10/BOS-LOGO.png 0 0 editor.jcorth http://jcorth.com/wp-content/uploads/2016/10/BOS-LOGO.png editor.jcorth2017-07-10 08:49:302017-12-12 09:16:24Orthopaedic Complications: how to prepare ourselves for one! 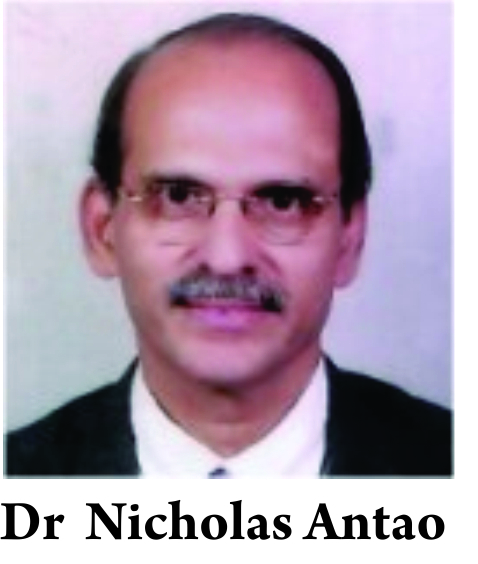 Journal of Clinical Orthopaedics | Vol 1 | Issue 1 | July – Dec 2016 | page:1 | Dr. Nicholas Antao. Hill Way Clinic, Hill N Dale Building, 4th Floor, Hill Road, Bandra West, Mumbai – 400050. The Executive managing committee of the Bombay Orthopaedic Society (BOS)had a dream, and this Journal of Clinical Orthopaedics christened as JCORTH is their reality. I am grateful and excited at the opportunity to share the dream and vision as the Editor in Chief. The untiring support of my editorial board, the contribution of the international and national authors, has seen the fruition and the first issue is in your hands. In this 21st century, we are hurtling down the highway of information and knowledge in orthopaedics, evidence based orthopaedics, newer trends , orthobiologics and use of robots. This inaugural issue carries invited articles on topics of clinical interests and other important issues in clinical orthopaedics, besides a potpourri of selected articles from different journals in various sub specialities and case reports. Newer and more expensive treatments do not necessarily guarantee better outcomes in disease specific situation, but an analysis of relevant treatment adapted to suit the patients need is tantamount to success. The “case studies” are evidence based situation, long term follow up studies are guidances to remain patient focussed, within a strong scientific background. “My journey through orthopaedics” by one of the doyens of orthopaedics is another highlight of the journal, that we hope will be a source of inspiration for us all. We at the editorial board hope, you will enjoy and benefit from reading the journal. We would appreciate your effort of sending in papers/research/case studies for publication in future issues. Your constructive criticism, observations and involvement in our endeavour, would also be valued and welcomed by the editorial board. I sign off in the words of William Shakespeare. We will certainly strive our best to make the journal an indexed one and will leave no stone unturned in this journey. How to Cite this article: Antao N. Editorial. Journal of Clinical Orthopaedics July – Dec 2016; 1(1):1.